In last week’s blog, written when it was dry, sunny and mild, I mentioned the new Sava River Trail, vowing to write more about it this week once I had had time to further explore it. However, once again the weather scuppered my plans. I must admit, I did wonder about the wisdom of erecting the signage and arranging the path at this time of year which is notoriously wet, since, as the name suggests, the path runs alongside the Sava river and even during the driest of months will be wet in places. After last week’s torrential rain and flooding, it will be impassable in places so I’ll write about that at another, drier, time of year; goodness only knows when that will be though as this year anything is possible! Last week it started raining on Monday evening and continued until the early hours on Sunday – literally – it didn’t stop, not even for five minutes. This has inevitably led to more widespread flooding, villages being entirely cut-off, and more heads being scratched and questions asked in a year that has, so far, seen an unprecedented 15 extreme weather events in Slovenia; beginning with the glaze ice in February and continuing fairly unabated since then. The sheer frequency alone should surely be more than a warning that we, and by ‘we’ I mean all of us – not just here in Slovenia – need to take climate change more seriously and, although we can’t interfere with nature, we can at least take more preventative measures and governments need to be assigning more funds to addressing flooding and other climate related issues. Oops, I’ll get off my soap box now! 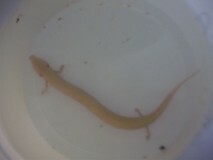 However, the flooding did turn up one interesting discovery, the very rare proteus, sometimes also known as a humanfish due to the colour of its skin, which was found in the flooded cellar of a house in Kompolje. These rare cave dwelling vertebrates live, eat, sleep and breath in the subterranean waters of the karst caves, and are an endemic species of the Dinaric Alps. They are only found in Slovenia, specifically at the Postojna caves, and occasionally in neighbouring parts of Italy and Croatia which share the same karst characteristics. In this case, it was carefully captured and collected by the relevant cave experts who could ensure a safe return to its habitat. Also in last week’s blog I mentioned the arduous task facing me(!) of visiting the remaining restaurants which have now joined the Taste Radol’ca collaboration, and which I have yet to review. 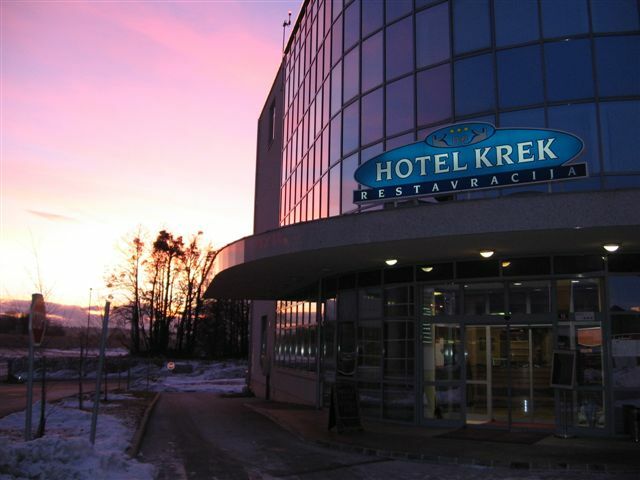 This week then, it was the turn of Hotel and Restaurant Krek in Lesce. 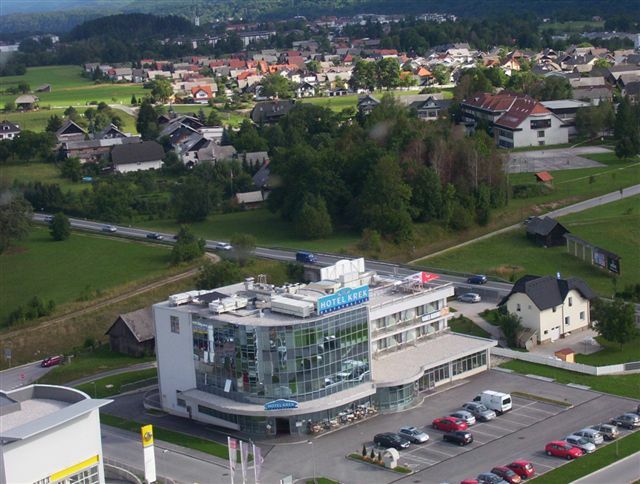 The hotel is situated just off the motorway at the exit for Lesce/Bled, next to the services, a casino and a coupe of supermarkets. It is a particularly popular destination for those transiting through Slovenia, as well as those looking for a mid-priced, convenient hotel close to Bled, Radovljica and the surrounding areas. The hotel’s restaurant is particularly popular at lunchtime with locals who pop in for daily light lunches (malice) and it’s large function area also regular hosts business events, seminars etc. Lesce Sports Airfield, from where panoramic flights across the Julian Alps can be taken, is just a few minutes from the hotel. Having lived here for over 7 years now, I have been past the hotel hundreds of times, on my way to the shops and/or for petrol. However, I will admit, that it never occurred to me to go there for lunch or dinner. Having met and had a similar discussion with the management, I realise this is perhaps a common misconception as one wouldn’t necessary think of going to a hotel restaurant for dinner, thinking of it as being merely for hotel guests. However, this is certainly not the case and by joining the Taste Radol’ca collaboration, Krek hope to further spread the word among locals and visitors about their restaurant and fortunately I also now know and can contest it is worthy of a pit-stop. A friend and I had the special ‘Taste Radolca’ menu, which is available for the whole month of November at 15 euros for 3 courses (the same price applies at all the other participating Taste Radol’ca restaurants during November). However, the restaurant also offers a full menu of other typical Slovene, and non-Slovene, dishes. 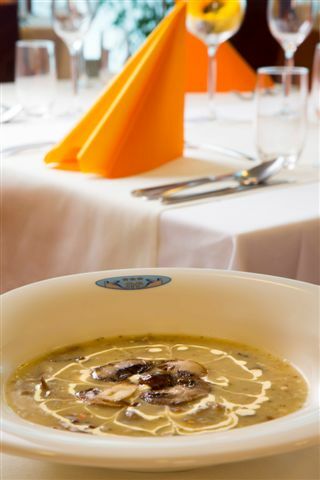 The food was beautifully presented, tasty and excellent value; mushroom soup to start (although I requested pumpkin soup as having tasted it at last week’s opening event, I knew just how delicious it was! ), followed by the main course of roast pork with honeyed-apples and a trio of struklji, for dessert triple-chocolate cake which was rich and chocolately enough even for me!